The pinnacle of Buddhism’s understanding of reality is the emptiness of all things. Exploring reality towards the realization of emptiness is shockingly radical. It uncovers an exhilarating freedom with nowhere to stand, while engendering a loving joy that engages the world. This path-breaking book employs the emptiness teachings in a fresh, innovative way. In addition to citing historical models and meditations, Goode and Sander have created over eighty original meditations on the emptiness of the self, issues in everyday life, and spiritual paths. These meditations are guided both by Buddhist insights and cutting-edge Western tools of inquiry, such as positive psychology, neuroscience, linguistic philosophy, deconstruction, and skepticism. The result is a set of liberating and usable tools for Buddhists and non-Buddhists alike. [Emptiness] is part of the natural state of everything. Sander and Goode explore the living spirit and liberating potential of these teachings, making them accessible and relevant to modern readers. …At once both intelligent and thoroughly accessible. 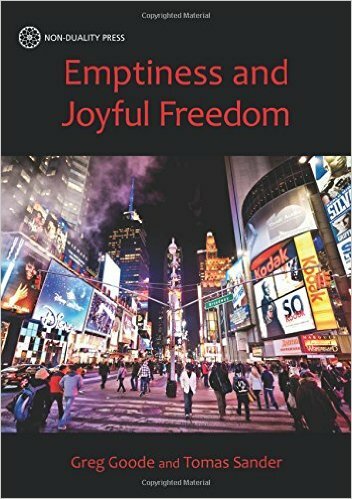 This is a wise and compassionate book, a good read for anyone interested in exploring the profound teachings on emptiness.